How much do you think it would cost to drywall your garage? When I looked at the material cost...it seemed quite...cheap. Which leads me to believe that might I'm missing something. I have a nice air compressor that's mounted on the wall so I'm good there. The lighting is something that I'm going to do for sure. Also thinking about building a kegerator as well. Figured I'd pitch that idea over Valentines Day dinner... I think it'll be fun to have car shows, or racing going on the TV while I'm working on the cars too. Cheap and easy to do yourself. I just did mine with green board sheet rock. Two car garage was about $150 to insulate, sheet rock, putty and prime. Maybe mentioned before, but often codes say you must use fire-retardant drywall on attached garages. Even w/o code requirement, better to have a garage and no house (or vice-versa) than lose both. 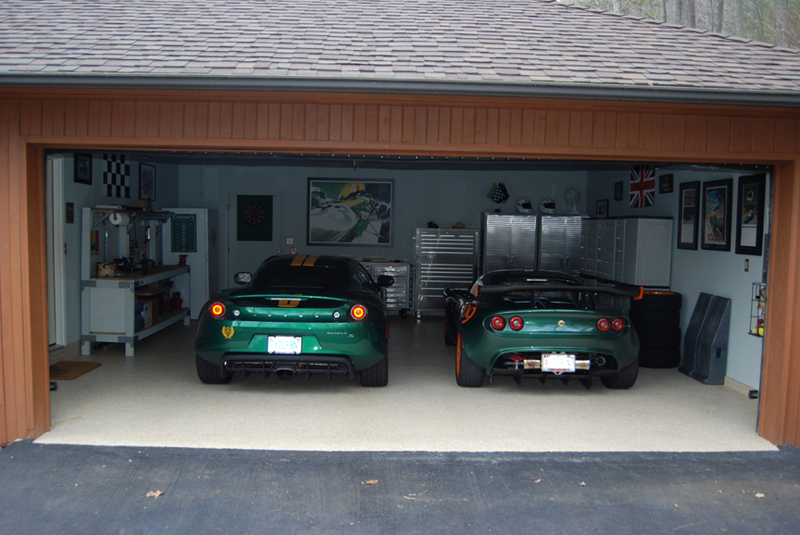 Wow, thats a killer garage! Great ideas there. You are going to need high lift rails for your garage door if you plan on installing a lift. I would also put in a side mounted garage door opener. Retractable extension cords are really useful as well. Drywall, insulation, paint, etc would probably be ~$2K, and since I have a back injury, serious allergy to fiberglass, and hate heights, i'd have to pay someone else to do this, so I'm guessing >$5-6K total. Some of this will cost more than if I'd had it done as part of the initial construction, because an electrician will now come back to pull the outlets out for example, but finishing the interior just wasn't in the budget back then. I also wish I'd thought to run a line from the propane supply the first time around, so I'll have that done with the next batch of improvements as well. Not much not already said, but my "votes"
Epoxy is my choice. Professionally done not a diy from Home Depot or such. Can't have enough light. I like LED cans on a dimmer. A bunch of them. Place for a big screen. Dartboard (from England) away from cars. Any more details on your garage? 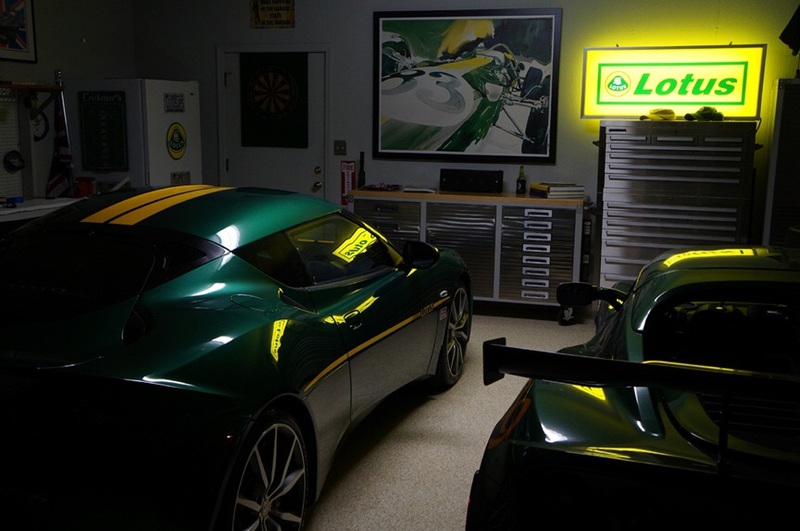 Love the lotus painting/poster on the wall. Already have large widescreen TV to hang on the wall too. Not really, just tried to keep it simple. Notice we made a "baseboard" of thin cement blocks, with epoxy carried up on them. Always wanted a garage with framed auto art on the walls. A lot more now than in this picture, including the pan from LOG last year. Drywall is pretty straightforward, and is made easier by a drywall lift that can be rented, to save your back. My garage was already drywalled when we moved in, and putting in electrical circuits and air plumbing is much more of a problem. In your case, you are actually ahead of the game right now. You can plan electrical, air plumbing, lighting, and insulation before drywalling (if I've understood you correctly). If your garage is attached, fire retardant/resistant drywall is really the way to go. You'll likely sleep better at night. If you want air, go with an oiled unit, as the noise is much less and if you need large volumes for a media cabinet or painting, you will need a two-stage unit putting out 18 SCFM or greater. Those are permanent installations and 220 volt units hardwired into your electrical panel. I'm going to be using RapidAir for the plumbing as it's neat and easy to change with changing needs. It's a bit more expensive, but worth it in the end, in my view. Before drywalling, also consider a mini-split AC/Heat Pump, which will allow you to work year-round in relative comfort. The great thing about these efficient units is that they also control humidity, which is great for our cars as well as workshop consumables like sand paper. You have the luxury of easily insulating the garage, as well. Once all the prep is done, then you can drywall, and you can end up with a beautiful and clean area that you can actually work in as well. I made the mistake of thinking of systems rather than sitting down and planning on how all this would work together. You have the advantage of being able to do this now before you cover up the walls/ceiling with drywall. Take photos (or do dwgs) of any wires, pipes, etc that will be hidden by the drywall. ^^^^ great idea. So easy to do beforehand. Wish I'd done that when we built our office building. Issues with plumbing etc that have come up since would have been totally easier to address. I'll be following suite too next month. I made the decision to go with VCT flooring. My biggest concern is that we built a new home and the garage is already drywalled but not ready for paint. I'm trying to figure out the most cost effective way to install more outlets etc. Unless you have loose insulation already in the walls, if you want to add more than a plug or two, I would buy a bunch of pizzas, invite some friends over, figure out where the full sheets start and rip the drywall off by the sheet - like all of it. It is sooo easy to re-hang as opposed to fishing and patching. And besides, then you can insulate if it isn't already. And you can add everything you want instead of "just enough". Run air lines for the compressor, add a switched outlet to the exterior and build a doghouse for it so the compressor can be outside of the garage.